AC/DC is a hard rock band from Australia. They formed in Sydney, Australia in November 1973. AC/DC has sold an estimated 200 million albums worldwide, including 68 million in the United States of America. 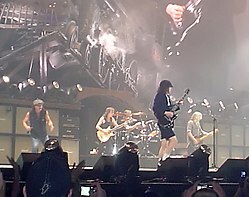 The two primary founders of the band, Malcolm Young and Angus Young, developed the idea for the band's name after their sister Margaret saw the initials "AC/DC" written on a sewing machine. "AC/DC" is an abbreviation for "alternating current/direct current," which refer to the two different types of charges used in electricity. The band chose the name because of their energetic “electrical” style of playing rock and roll. Even though AC/DC considers their music style simply as "rock and roll", AC/DC are often considered pioneers of heavy metal. ↑ "Back to roots for AC/DC". Sydney Morning Herald. Retrieved 2008-05-02. ↑ "Top Selling Artists". Recording Industry Association of America. Retrieved 2008-08-02. ↑ Dale Hoiberg, ed. (2007-09-24). "AC/DC". Encyclopædia Britannica Ultimate Reference Suite (2008 ed.). ISBN 1-59339-292-3. ↑ Dale Hoiberg, ed. (2007-09-24). "heavy metal". Encyclopædia Britannica Ultimate Reference Suite (2008 ed.). ISBN 1-59339-292-3. This page was last changed on 8 December 2018, at 19:02.